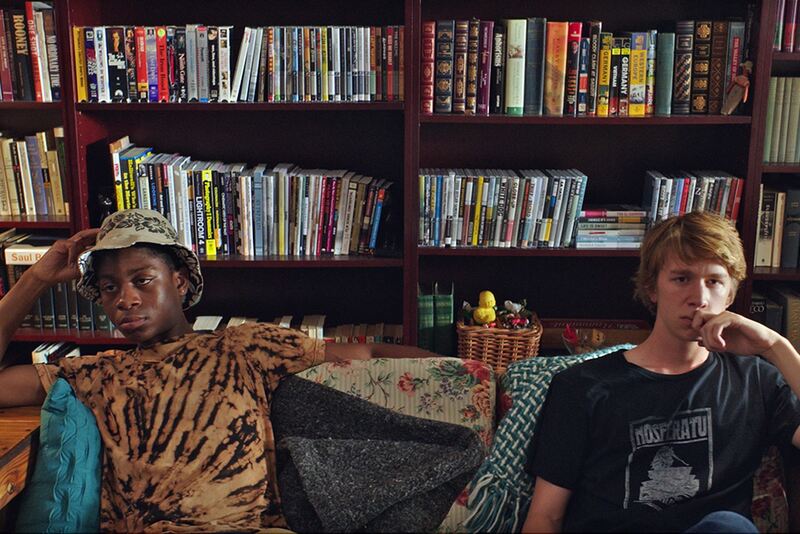 Film Review: ‘Me, Earl, and the Dying Girl’! The cliché that a person is never truly gone from this earth if they live on in your heart is played out beautifully in a really non-clichéd way in Me, Earl and The Dying Girl. This film tackles a lot of topics in a seemingly effortless manner: death and dying, parent/child relationships, friendship, how to survive high school, self doubt, and growing up. Alfonso Gomez-Rejon (American Horror Story) directs an all star cast whom each shine individually and are remarkable as an ensemble. Thomas Mann plays Greg Gaines, an awkward self-proclaimed hedge hogged face senior in high school who narrates the film. Opposite him is Rachel Kirshner, played by Olivia Cooke. Rachel is diagnosed with leukemia and Greg is forced to hang out with her by his mother, played by the fabulous Connie Britton. The always incredible Nick Offerman plays Greg’s dad. His character is really an enjoyable addition, as his quirks, costumes and the general presence he brings to the screen never disappoints. Newcomer RJ Cyler, plays Earl. I guarantee you’ll be seeing more of Cyler because he’s got talent that has gone untapped until now. Rounding out this cast is the hilarious Molly Shannon. She plays Rachel’s mom, and the state she’s in as her daughter is dying brings laughter to the screen, as you should expect with this SNL alum. As Greg begins to embark on his forced hang out sessions with Rachel, it’s not all that smooth. They don’t have much in common and neither really wants to be there. As I’m sure you’ve guessed, the obligatory nature of their friendship fades away and Greg and Rachel ease into a rhythm that feels safe and natural. Greg is very self-deprecating and doesn’t open up to anyone, even Earl, someone he has known and hung out with since Kindergarten. He introduces Earl to Rachel as his co-worker, and lets her in on their secret- that they make movies together. Earl and Greg spend their time making parody films. As Rachel’s cancer takes hold, an idea comes up to make a movie for her. This proves a difficult task for Greg, because what do you say to a dying girl? What is the appropriate sentiment for that? As he works on the film, he realizes how much he cares and how much he’s already let her in. By the time it’s complete, he’s ready to bare it all. He’s grown up in ways he wouldn’t have imagined. As you can tell from the title of the film, it’s sad. But it’s also a really funny movie. Its dialogue is perfect and it depicts high school flawlessly. It’s a great reminder that even after people are gone, there’s a lot left of their life. Whenever life ends, there may be more left to learn from that person, they may have more to give, and their love for you never dies. It’s a really touching story that makes you want to reach out and hug someone. Bring the tissues. Film Review: ‘Me and Earl and the Dying Girl’! This entry was posted on Sunday, April 19th, 2015 at 3:46 pm	and is filed under Film, News. You can follow any responses to this entry through the RSS 2.0 feed. You can skip to the end and leave a response. Pinging is currently not allowed. « Film Review: DIFF 2015 Shorts! !